NASA's Solar Dynamics Observatory caught these bundled magnetic loops sprouting from the sun's surface on Nov. 11, 2015. The sun is supposed to be entering a quiet period, but it's still showing signs of the 11-year peak of activity it reached in early 2014, new videos show. 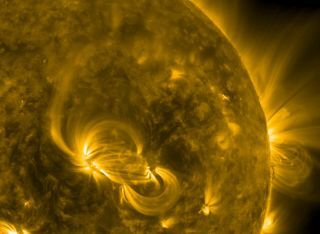 On Nov. 11 and Nov. 12, NASA's orbiting Solar Dynamics Observatory (SDO) caught stunning footage of "arches of bundled magnetic loops" spouting from the surface of Earth's parent star. "Charged particles spin along the magnetic field, tracing out bright lines as they emit light in extreme ultraviolet wavelengths," NASA officials said in a statement describing one of the videos. "About halfway through the video, a small eruption from the active region near the center causes the coils to rise up and become brighter as the region reorganizes its magnetic field." Three days later, as shown in a second video taken by SDO, the sun threw out a set of fireworks seen in several wavelengths of light when coronal mass ejections, or streams of particles, erupted from the sun into space. The website Spaceweather.com, which monitors space weather and skywatching events, called it a rare "canyon of fire" created by erupting plasma that "stretched for more than 300,000 km [186,000 miles]." The sun's spikes in energy can also have an effect down on Earth. Coronal mass ejections can produce auroras, which are the light shows high in the atmosphere that occur when the particles emitted from the sun interact with Earth's magnetic field and "excite" atmospheric molecules so that they glow. More severe solar storms can cause outages in satellites and even power lines, as famously happened in Quebec in 1989. SDO launched in 2010 to investigate how solar activity is produced and to make predictions about space weather caused by that activity, according to NASA's mission website. The spacecraft measures the sun's interior, magnetic field and hot plasma.